The two block pedestrian lane in San Francisco’s Russian Hill neighborhood is a charming and unique residential spot with extraordinary views of Alcatraz Island and the San Francisco Bay. 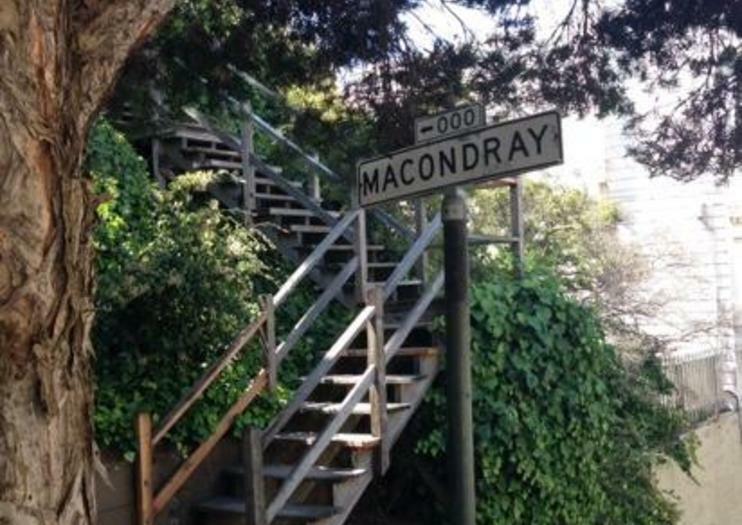 Tucked away from the busyness of the main streets, Macondray Lane is known for its Edwardian style cottages with wooden exteriors, covered in flowers and greenery. Its cobblestone walkways and overflowing gardens create a unique oasis in the middle of the city. Between ferns and flowers, look closely and you may even see the small pond. At one end of the lane lies a series of steps that offer up some of the best bay views. Fans of the Armistead Maupin's Tales of the City books may recognize the area (known as Barbary Lane in the books) — various scenes were set here and still come to life for many who visit.